The crew awaiting the next guided tour of space. I.C.A.R.U.S., was a collaboration with Hong Duck Chea, Jerel Dye, Pete Froslie, Jake Lee High, Carolyn Shadid, and Chris Wawrinofsky, as part of the Boston Cyberarts Festival 2007, installed at the Doran Gallery, Masachusetts College of Art in Boston. This large scale installation, accompanied by two evenings of performance, set out to question our reliance on the Internet as a primary source of entertainment and information. The I.C.A.R.U.S. 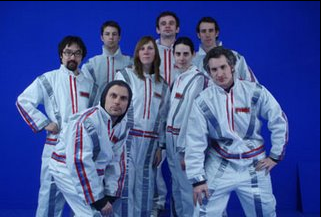 space crew (pictured below) sought to explore our changing definition of play and escapism by constructing a rocket ship that offered a simulated experience of space travel. Visitors to the gallery were invited to board the vessel made primarily from salvaged material(cardboard, plastic, tape, felt, and other diiscared goods), there were also two nights of performance during which the entire crew boarded the vessel and offered narrated "departures" to space every half hour.